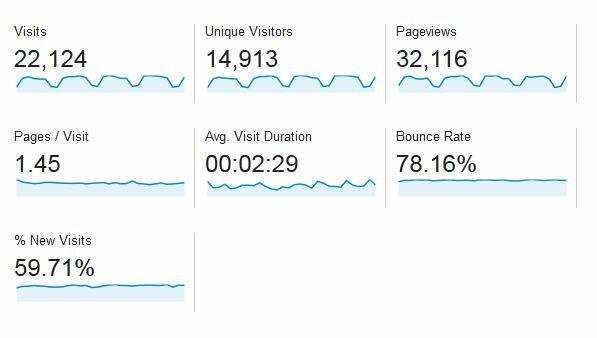 After publishing my traffic numbers from 2011-2012 and the first part of 2013, I’m returning to a standard monthly my traffic cadence starting with the September numbers – when I didn’t publish any new posts. This is going to be an interesting reference month because I can get a good idea of the baseline traffic I can expect to get in a period when I don’t focus on putting out new content. Out of the total traffic for September, search was 72% – a 8% bump from 64% in August. This is of course related to the lack of content this month. First, as expected, Feedly dropped off the top 10 because I had no new content during the month of September. Disqus is still going strong and now occupies spot number 7 in my list. Otherwise the top 10 referrers are largely stable compared to the first part of the year. This is the first traffic number article focusing on a single month – and a very toned down month at that, as changing job meant that I didn’t have time to focus on new content. Next thing on the list is publishing the results of my first (public) experiment – how changing the copy of my Email Signup Form affected email signups – which should be coming out in the next few days now that all the data is in.